Welcome to My Cruise Blog from the Cruise Village. Here you will find the latest Cruise News and low cost Cruise Deals from all cruise lines! Call free to book any cruise on 0800 810 8229 or visit www.thecruisevillage.com for our latest cruise deals! The following information has been provided by Holland America Line. 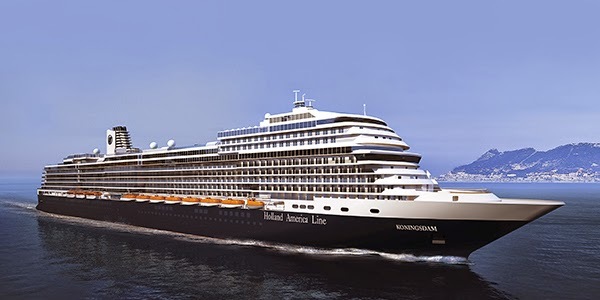 Earlier this week Holland America Line announced the name for its new Pinnacle Class Ship which is scheduled for delivery February 2016; ms Konningsdam. While the name is in honor of Holland America Line's rich heritage and deep roots in the Netherlands, it also reflects a new era with a bold name that is an original in Holland America Lines 141-year history. Since 1883 every Holland America passenger vessel has borne the “dam” suffix, and ms Koningsdam carries on that tradition. The word koning means “king” in Dutch, and the name celebrates the majestic new ship. The name also pays honor to His Majesty King Willem-Alexander, the first king of the Netherlands in over a century. When it debuts in February 2016, ms Koningsdam will be a new type of ship for Holland America Line. At 99,500 gross tons and carrying 2,650 guests and 1,025 crew members, the vessel is the largest ever built for the company. The increased size provides more opportunities to add new public spaces and venues, and several innovative features will debut on ms Koningsdam. Familiar spaces and amenities currently featured across the Holland America Line fleet will also be found on the new ship. To bring a fresh vision to ms Koningsdam, Holland America Line tapped Adam D. Tihany, one of the world’s pre-eminent hospitality designers. Tihany joins distinguished maritime designer and architect Bjorn Storbraaten who worked with Holland America Line on ms Nieuw Amsterdam and ms Eurodam. The two firms will create a modern and contemporary ambiance while incorporating Holland America Line’s classic hallmarks. Visit The Cruise Village today for our latest cruise deals. The Cruise Village Cruise News Blog. Powered by Blogger.